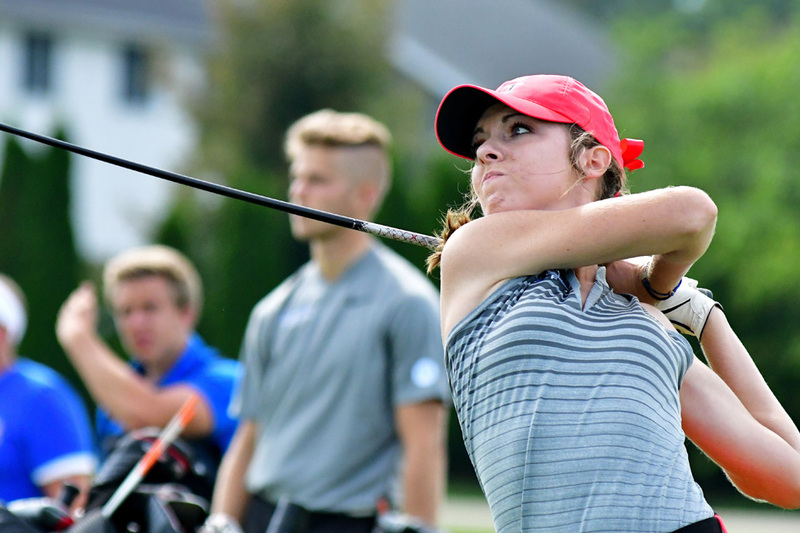 WINONA LAKE – In the spring of 2015, the women’s golf program at Grace College didn’t exist. Now, in the spring of 2018, the Grace Women’s Golf team ranks in the top 50 of the NAIA. After years of campaigning for a women’s golf team, Grace College employee Denny Duncan’s wish was finally granted. Duncan was handed the reins to the women’s golf program in the fall of 2014, with the team starting competition in the fall of 2015. The first problem he faced, like most programs in their inaugural year, was developing a recruiting pitch for a team that didn’t exist. Fortunately for Duncan, Lauren Keiser fell right into his lap. Keiser, who was a prominent high school distance runner from Ohio, found the school after Grace track coach Jeff Raymond reached out to her. After Keiser told Raymond about her dream to play college golf, Raymond sent her profile to Duncan who was in desperate need of that first signee. Within a week of learning about Keiser, Duncan went to watch her play in her sectional tournament. This was ultimately the start of a relationship that will forever have a massive impact on the women’s golf program at Grace College. Duncan’s belief, passion, and commitment were common themes when talking to Keiser. Coaching golf for Duncan is a vehicle that he uses to help develop relationships that will last a lifetime. As the team has grown, so has Duncan. Looking back on his first three years of coaching, he said, “I’ve grown so much… the first year I didn’t have a clue.” Their year-by-year results speak for themselves, as the team’s scoring average dropped from 378 in the first year to 348 in the second. This year? They are averaging under 330. The team recently placed fourth in the Crossroads League Championship, finishing only four strokes out of second place. Grace was the only team with two top five finishers, as Keiser finished third and Sydney Abbott placed fifth. Anna Marshall rounded out this year’s success by being the first Grace women’s golfer to ever be named to the All-Crossroads League team. Additionally, Keiser was named the NCCAA National Golfer of the Week this week for her exploits at the Crossroads League Championships. Her third-place finish in the league finals was the best individual finish in the three-year history of the program. The girls won three tournaments in the fall and have already won another one this spring. From not having a team to having nine first place finishes in three years and multiple individual national qualifiers, this program is everything Duncan has ever wanted and more. Even as the stature of the Grace Women’s Golf program has grown, Duncan has stuck to his roots and aspired to develop a unique family atmosphere within his teams. A program that once had to convince Lauren Keiser to be their first player has turned into a consistent tournament contender, and Duncan says his recruiting pitch has stayed the same.